New research shows that the butterflies may be more vulnerable to extinction than we previously thought. Monarch butterflies are in serious trouble. Perhaps the most iconic insect in the United States, this butterfly has existed for countless millennia and, every year, it accomplishes the longest known migration of any insect in the world. Monarch butterflies have been decimated over the past 20 years due to the loss of milkweed in the Midwest. This once common plant is the only food the butterflies’ larvae eat, and as milkweed goes, so go the monarchs. What’s worse, is the fact that these butterflies’ main summer mating grounds are smack in the middle of the U.S. Corn Belt, where milkweed has been almost eliminated due to the large-scale use of glyphosate (or Roundup) herbicide on genetically engineered corn and soybeans. Now, new research by a group of scientists from around the nation reveals that monarchs may be even more vulnerable to extinction than previously understood. And this in turn means that listing the monarch as threatened under the Endangered Species Act is even more urgent than we thought. These revelations come despite the fact that there was an initial increase in this year’s overwintering monarchs in Mexico. While some news sources reported that the monarchs were “making a comeback” or “on the rebound,” such increases have commonly occurred in previous years. And while the latest news stories linked the reported increases to more milkweed planting, most of these often substantial population fluctuations are more likely caused by factors such as favorable or unfavorable weather. And, as if on cue, a major winter storm has recently reduced the overwintering population. So the optimism about this year’s population increase seems to have been premature. And, in much the same way that a particularly cold winter in one part of the world does not have anything to do with fact that the surface of the planet is getting warmer due to climate change, this year’s increase in monarchs provides no evidence that the long-term trend toward their decline has been reversed. And if the welcome, but limited, planting of milkweed along roadsides, and in parks and gardens has helped, any effect is likely to have been very small. We know that monarch butterfly populations fluctuate greatly, but this new research may also help us better understanding their historic fluctuations by enabling the scientists to place actual numbers on them. By using analytic methods not previously used, these scientists estimate that if current trends are not reversed, there is between an 11 and 57 percent risk of extinction of the Midwest migrating population (the main population by far) within the next 20 years. Because weather is an important factor in the monarch’s survival, their populations must remain high enough to withstand weather events and other factors that can cause large annual die-offs. 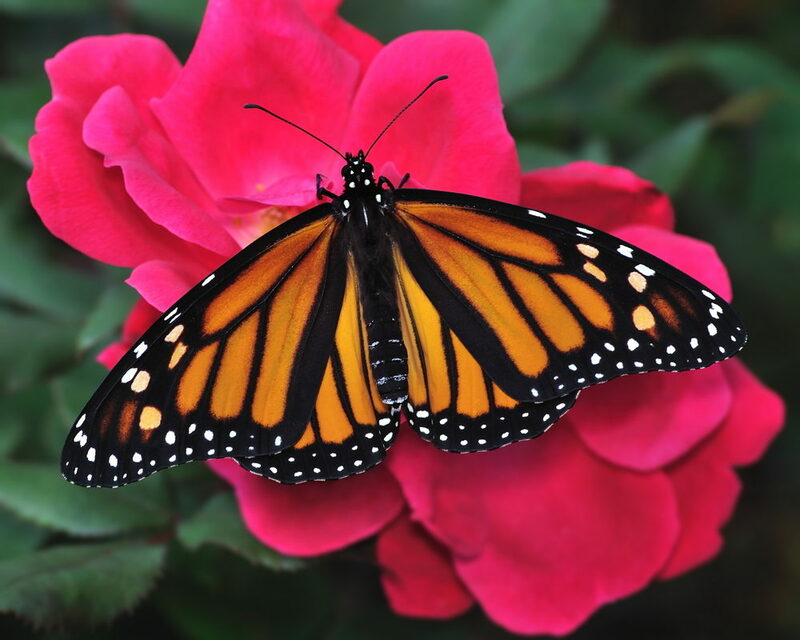 The new research uses several scenarios, based on the best biology available to estimate the lowest numbers of monarchs in Mexico that would allow for survival of the main, Midwestern population of the species, and allow it to bounce back. And, in fact, when the scientists use overwintering numbers they think are the most reasonable for survival, the likelihood of extinction over the next 20 years rises to between 52 and 62 percent if trends are not reversed. Not only does this new research make some of the first substantive efforts to quantify the risk of extinction, but the scientists also found in the process that the current government and industry plans to save the monarchs may not be enough. In 2014, President Obama issued a presidential memorandum, followed in 2015 by a plan to create a taskforce “to promote the health of honey bees and other pollinators,” including building a “pollinator highway” to help the butterflies travel down the length of the country to Mexico. The task force set a goal to increase the Eastern population of the monarch butterfly to 225 million. The study’s authors found that even if that goal is achieved at some point, the large population fluctuations could reduce monarchs below the point of survival. While some of the scenarios the authors explored, using the task force goal of 225 million butterflies, would probably prevent extinction, one of the most reasonable would result in a high likely of extinction (25 percent) in the next 20 years. This is well above the 20 percent extinction risk that is required for listing as threatened by international standards. Listing monarchs under the Endangered Species Act would open a number of paths to restoring the butterfly, including potentially in the agricultural lands that dominate its Midwestern habitat. A listing would also make these efforts mandatory, which is unlikely to be the case otherwise. If the monarch were recognized as threatened, farmers and scientists would be given access to new ways to use land creatively to restore a healthy population of monarchs. These should include methods such as planting strips of native prairie on farmland and using diversified cropping systems, which also benefit farmers and the environment in other ways. The study’s authors emphasize that there is a lot of uncertainty in these numbers, for better or worse. One factor seemingly not accounted for in their calculations is the impact of climate change, which could add the risk of extinction. But these uncertainties should point us even more strongly toward a robust conservation plan that doesn’t cut corners, and that means listing monarchs as threatened. has prospered there ever since. So we see the North American monarch butterfly migration is not a fragile phenomenon that is vulnerable to extinction. The opposite is true. Individuals can make a difference, too. Our major priority should be to create habitat by planting native (please source these from your geographic region) milkweed and nectar sources. Check out Monarch Watch's Milkweed Market and Xerces Society Milkweed Project to find sources for native milkweed. Nectar sources are critical for their migration. If you'd like to learn how to create habitat, attract, and rear butterflies, moths, and pollinators, hobbyists are welcome to join our Facebook conservation group. Rearing is optional, learning how to create habitat is critical for their survival. Search for "Raising Butterflies and Moths for Conservation (+ All Pollinators) on Facebook. I recently conversed with a scientist after reading his article on Monarch's. He was able to confirm one thing for me. I told him about how in my central Texas city, all the once wild fields, old farms and ranches that used to have native plants on them are now covered with subdivisions. Among all those houses with their manicured green lawns you aren't going to find any milkweed either. He agreed and called cities, "green deserts". We love to point our fingers at a corporation that is simply trying to maximize yield per acre so we have more food, at lower prices, while using less land to grow our food. But we ignore the damage that we as individuals and homeowners are causing by having our nice green lawns, that we can't even eat. (The 2015 estimate was prior to the winter storm in Mexico on 3/10/16. It is estimated that 35-50% of the Monarch population died during that storm.) Pollinators (the bees that pollinator our food) are also in decline. When we plant native milkweeds (host plant for the Monarchs) and nectar sources, we are creating habitat which is beneficial to all pollinators. Forestsformonarchs.org has planted 6 million trees in the monarch roost areas in Mexico. This has helped the monarch immensely. See their web site. Scheduled plantings are down for this year and next for lack of funding. Every contribution counts! Milkweed in the US and forest protection and management in Mexico are both critical to monarch survival. What a tragedy this is! My husband farms in Plymouth county, Iowa and we are trying to determine how many acres we can donate to this cause. I grew up on the farm and practically lived outside, the Monarchs were everywhere, it feels like a loss of part of your childhood. Thank you for writing this article.